Ink additives are materials that impart necessary characteristics to printing inks. These characteristics include protection of the finished product and smooth running on the printing press. Packaging is a highly important marketing aspect that influences consumers’ purchasing decision. The packaging industry is a major consumer of printing inks. Growth of the food & beverages sector and rise in the demand for flexible packaging in the health care sector are estimated to boost the demand for ink additives in the next few years. Increase in the demand for inks in the global packaging industry is projected to drive the global ink additives market during the forecast period. The global packaging industry was valued at approximately US$ 820 Bn in 2016 and is likely to expand at a rapid pace during the forecast period. Ink additives are employed in the manufacture of all types of printing inks. The trend of e-commerce and e-books is growing at a significant rate across the globe. It is hampering the publication & commercial printing industry. Thus, substantial decrease in paper-based communication is estimated to restrain the global ink additives market during the forecast period. Prominent trends in e-commerce include e-books, event tickets, sporting goods, toys, and hotel and airline reservations. These trends are anticipated to restrain the printing inks industry largely in the next few years. This, in turn, is anticipated to act as a restraint of the global ink additives market during the forecast period. Ink additives are available in several forms such as dispersants, defoamers, waxes, and surfactants. Different types of ink additives offer different end-results. For example, plasticizers enhance the flexibility of printed films; waxes promote rub resistance; chelating agents increase viscosity of inks and improve adhesion; surfactants improve the wetting of pigments or substrates; while defoamers reduce surface tension in water-based inks. Ink additive manufacturers can collaborate closely with printing ink manufacturers to understand the precise requirement of the latter and manufacture printing inks accordingly. Such collaborations can help printing ink manufacturers develop printing inks tailored for specific printing processes such as lithography, flexography, gravure, and digital printing or applications such as packaging, publishing, and commercial printing. Ink additive manufacturers stand to gain considerably by building close relations with printing ink manufacturers and providing customized ink additives. Wetting agents are the most commonly used ink additives. Advantages of wetting agents driving their consumption include development of required surface tension and contact angle, hydrophobic nature, and multifunctional capabilities such as acting as dispersants, defoamers, and levelling agents. In terms of multifunctional capabilities, wetting agents are more commonly used as dispersants than defoamers. Companies manufacture a wide range of wetting agents and try to impart different combinations of properties to these agents. Printing inks required in the flexography printing process consume ink additives in the maximum amount. The flexography segment is expected to be driven by increased use of the flexography printing process in various applications such as packaging, publishing, and commercial printing. Lithography and digital are also expected to be relatively attractive printing process segments during the forecast period. While lithography is an old printing process, it is still used significantly. It deploys several moving parts such as printing plates, resulting in high consumption of ink additives. On the other hand, digital is a significant printing process segment of the market for ink additives, as the technology is being adopted rapidly by industries such as packaging and publishing. Solvent-based printing inks consume the maximum amount of ink additives, as these inks are consumed the most. Solvent-based inks are preferred due to their low price and easy availability. Hence, their usage is likely to continue during the forecast period. Packaging is the most common application of printing inks. All types of packaging require printing inks to denote information, such as logo and design, on them. The packaging industry is expected to continue expanding during the forecast period and hence, consumption of ink additives in the industry is also expected to increase. Commercial printing was the second-largest consumer of printing inks in 2017 and, in turn, of ink additives. Commercial printing consumes ink additives in large amounts, especially in industrial printing including printing of instruction manuals and figures of associated machinery. Asia Pacific is considered a manufacturing hub of the world. It produces printing inks in large quantities. It is also the world’s largest consumer of ink additives. Similarly, Europe is a major hub for printing ink companies and also, a major consumer of ink additives. The global ink additives market is moderately consolidated, with a few multinational companies accounting for a significant share of the market. These companies have managed to develop several brands of ink additives and product lines. They have also developed a vast network of distributors to penetrate markets in various countries and regions. Key multinational companies operating in the global ink additives market are BASF Group, The Dow Chemicals Company, Altana AG, and Evonik Industries. Printing ink manufacturers use ink additives to impart characteristics, such as different viscosities, thickness, and resistance to environment, to printing inks. This report analyzes and forecasts the ink additives market at the global and regional levels. The market has been forecast based on volume (kilo tons) and revenue (US$ Mn) from 2018 to 2026, considering 2017 as the base year. The study includes drivers and restraints of the global ink additives market. It also covers impact of these drivers and restraints on the demand for ink additives during the forecast period. The report also highlights opportunities for the ink additives market at the global and regional levels. The report includes detailed value chain analysis, which provides a comprehensive view of the global ink additives market. Porter’s five forces model for the ink additives market has also been included to help understand the competition landscape of the market. The study encompasses market attractiveness analysis, wherein type, printing process, printing ink, and application segments have been benchmarked based on their market size, growth rate, and general attractiveness. 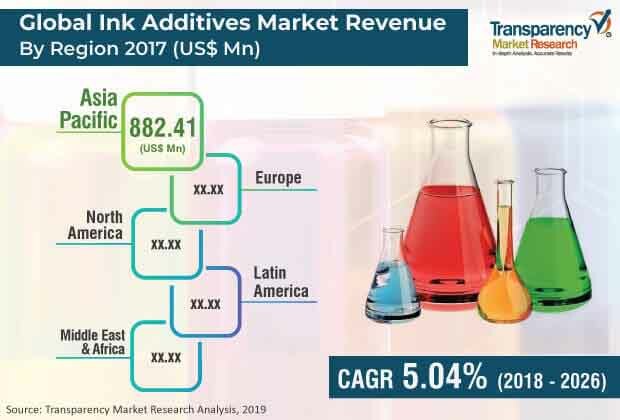 The study provides a decisive view of the global ink additives market by segmenting it in terms of type, printing process, printing ink, application, and region. In terms of type, the market has been segmented into wetting agents, rheology modifiers, and others. The wetting agents segment has been sub-segmented into dispersants and defoamers. Based on printing process, the market has been segregated into lithography, flexography, gravure, digital, and others. In terms of printing ink, the market has been divided into water-based, solvent-based, and UV-cured. In terms of application, the market has been categorized into packaging, publishing, commercial printing, and others. These segments have been analyzed based on the present and future trends. Regional segmentation includes the current and forecast demand for ink additives in North America, Europe, Asia Pacific, Latin America, and Middle East & Africa. The report provides size (in terms of volume and value) of the global ink additives market for the base year 2017 and the forecast for the period between 2018 and 2026. Market numbers have been estimated based on type, printing process, printing ink, and application segments of the global ink additives market. Market size has been provided for the global, regional, and country level markets. The report comprises profiles of major companies operating in the global ink additives market. Key players operating in the global market are BASF SE, The Dow Chemicals Company, Evonik Industries, and Altana AG. Market players have been profiled in terms of attributes such as company overview, financial overview, business strategies, and recent developments. Ink additives can be defined as raw materials that impart important characteristics to printing inks. These characteristics include smooth running on the printing press and protection of the finished product. Among types, the ink additives market is dominated by the wetting agents segment. Several advantages offered by wetting agents driving their consumption include development of required surface tension and contact angle and their hydrophobic nature. Packaging is the most common application of printing inks. The packaging industry is expected to continue expanding during the forecast period and hence, consumption of ink additives in the industry is also expected to increase. The global ink additives market is likely to expand at a sluggish pace during the forecast period, primarily due to the low amount of ink additives required in the production of printing inks.